This mashed potatoes make ahead recipe is one of the first freezer recipes I tried. I was great at planning and making a main dish but would leave the sides until the last minute. With frozen mashed potatoes ready to go in the microwave you have a homemade side dish in about 3-4 minutes with no work and no dishes. Many people think that mashed potatoes make ahead recipes don’t freeze well because some varieties, those high in starch, get grainy. Mashed russets get grainy, but keep a good texture when frozen as baked potatoes. Frozen mashed red potatoes and other waxy, low starch potatoes, do not get grainy. Also, reds don’t have to be peeled because their skin is softer and thinner which makes them easier to prepare. I always leave the skin on. Boiling is the most popular method of cooking potatoes before mashing. I have tried steaming them but felt I got a more glutinous or rubbery texture from the steamed potatoes. And baking the potato before mashing takes too much time. Peeling is optional, but you should remove an eyes or rough patches on the skin. Cut potatoes into equal sized pieces so they cook evenly and add salt to your water for boiling and flavor. Potatoes are done cooking when they can easily be broken apart with a fork. Drain but don't rinse potatoes and start to mash, do not let potatoes cool. You can mash by hand or with an electric mixer, handheld or kitchen-aid type, but avoid the food processor. The processor over works the potatoes and they get rubbery and gluey. Mash as little as possible to get the smoothness you want. Add butter, milk and seasoning salt to taste. I start with a big spoon of butter, splash of milk and light layer of salt on top. Mash into potatoes and taste. If you want it more buttery add butter. Add more milk for a creamer texture and add more salt if needed. You can also add pepper to taste. Your make ahead mashed potatoes should be fully seasoned so they don't require any more work when you thaw them. Try other add-ins like sour cream or cream cheese. Cooked veggies can also be added like with loaded baked potatoes, broccoli is great for this. For a lower calorie options try plain yogurt. Add garlic cloves to your boiling water when cooking the potatoes. Or add garlic powder to taste when mashing. Another option is to roast a head of garlic and add roasted garlic to taste to your mashed potatoes. Add herbs to the water while steaming, or add inside cheese cloth or a tea strainer to boiling water while cooking your potatoes. If your using fresh herbs they can be added to the mashed potatoes instead. Mix in grated cheese like parmesan, cheddar or mozzarella after mashing the potatoes. This mashed potatoes make ahead recipe is a very healthy side dish because potatoes are low in calories and full of nutrients. They have more potassium than bananas and a high amount of protein for a vegetable. Potatoes also contain iron, vitamin C, B vitamins, many minerals and fiber. The fat comes from the butter, milk or cream and other stuff we add, potatoes themselves are fat free. So the best way to keep potatoes healthy is to keep them as simple and natural as possible. That includes the skin, a 5.3 ounce or 150 gram potato with the skin on gives 2 grams of fiber which is as much fiber as many whole grain products like cereals, pastas and breads. I prefer to use a medium sized metal scoop, used for ice cream, cookies, or meatballs, that pushes out it’s contents for freezing mashed potatoes. Scoop potatoes onto a cookie sheet and put in the freezer for 1-2 hours. Take out of the freezer and package in freezer bags. I use one or two large bags and just take out however many scoops I need for dinner. Store 2-3 months as scoops in large freezer bags. 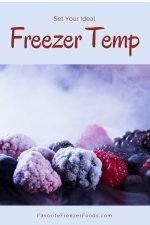 For longer storage freeze enough mashed potatoes for one meal in a small freezer bag or in a nearly full rigid container to avoid freezer burn. Mashed potatoes could be thawed in the refrigerator overnight and reheated on the stove, in the oven, crock pot or microwave. 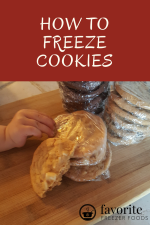 I generally pull them from the freezer at dinner time and microwave on high 2-3 minutes then test and add another minute if necessary. A larger quantity will take longer. Two scoops per person makes a good quantity for a side dish and take about 5 minutes in my microwave to reheat. They also cook faster if they are re-mashed and mixed so the center cooks faster. Return from Mashed Potatoes Make Ahead to the homepage of Favorite Freezer Foods.